Field Trip's Croque Monster doesn't have so much in common with a croque monsieur, but that's not a bad thing. Brunch served all day is enough to make us take notice. 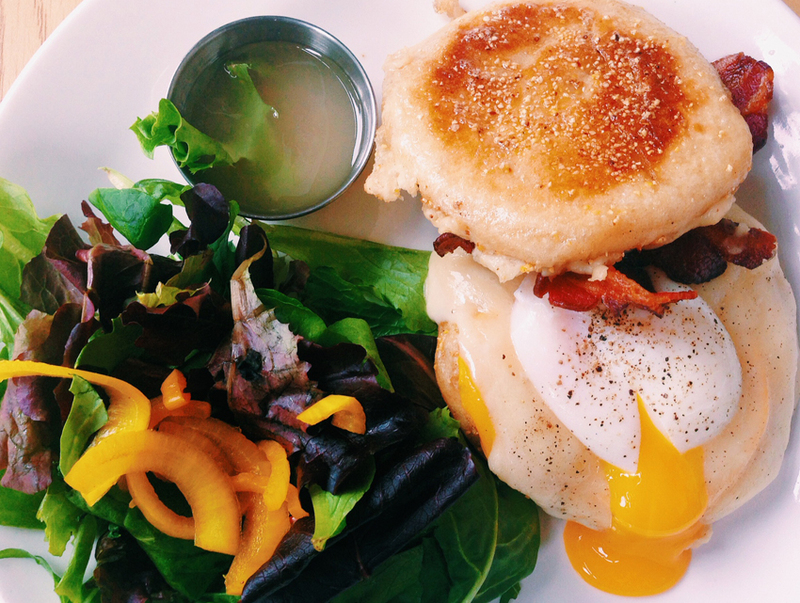 Throw in a housemade English muffin and consider us officially enticed. Meet the Croque Monster, served daily at Field Trip, a five-month-old restaurant from Minh Phan (Gaji, Beachwood Cafe), hidden in the Farmer’s Kitchen space behind a Bed Bath & Beyond. An extremely liberal take on a croque monsieur, the Croque Monster’s primary similarity to the French comfort-food staple is béchamel sauce. No matter, though, because the discrepancy is forgotten upon first bite, when jack cheese, sauce, and runny golden yolk become one, and Minh’s version is its own thing entirely. We won’t complain that the expected ham is replaced with crisp, thick-cut bacon, and who needs sliced bread when you can have pastry chef Sarah Lange’s (Hart & the Hunter, Ladies’ Gunboat Society) soft, buttery English muffins — the dish’s most noteworthy element. That undertone of nuttiness and the contrasting texture created by the coarse Italian polenta are essential to the sandwich’s allure. And, according to Minh, the importance of the roasted tomatoes, nestled between cheese and bread, also can’t be understated. “Right now, we are using organic Amish Gold heirloom tomatoes from Venegas Farms, which lend an acidity, contrasting and rounding out the ooey-gooeyness.” Minh says. You can enjoy the Croque Monster — Amish tomatoes and all — along with a locally minded menu that includes a seasonal selection of bahn mi, salads, and frittatas during Field Trip’s breakfast and lunch service. At night, from Thursday to Saturday, the restaurant transforms into Porridge + Puffs, which specializes in savory porridges topped with everything from pork to scallops.